It takes exactly 20 seconds of Sean Lennon’s new album to reveal his biggest problem in pursuing a pop career — he sings exactly like his father. The reedy, nasal vocal is pure John. The gentle rasp when he extends his range is pure John. Even the pronunciation — “loovin’ you” — suggests a Scouse upbringing. Which is weird, because Lennon was born and raised in New York City, was five when his father died, and went to boarding school in Switzerland, which is generally a Scouse-free zone. Sitting in a room at the Beatles’ old label, Parlophone, just down the corridor from where his dad beams out from a Let It Be poster, Lennon also looks like his father. And his mother. He’s a 50-50 fusion of John and Yoko. Until he opens his mouth, when he speaks slowly and quietly in an all- American accent, choosing his words with great deliberation. His clothes seem to have been picked with a similar attention to detail. He’s wearing a pinstriped trousers and waistcoat ensemble with a smart shirt and tie, and big dark glasses. He has tousled jet-black hair that hairdressers might call “unmanageable”, and a few days’ growth of beard. There’s a bit of an am-dram feel to the film, despite its star cast, lending it something of the air of a school play. Lennon and his famous friends lark about in extravagant costumes (including a Sgt Pepper-style military tunic for Lennon), acting out capers in different styles and periods. Meanwhile, the music and lyrics, while conjuring up ghosts of his father, might unkindly be described by critics as Imagine lite. It is impossible to listen to it without making comparisons to Lennon Sr. Which is odd because, after his debut album in 1998, Lennon Jr castigated himself for making it “way too Beatles for the world” (even though it wasn’t) and vowing that his next would “make the point that I’m not trying to copy my parents”. In fact, the new album is far more Beatlesy than its predecessor and lacks his earlier experimental edge. 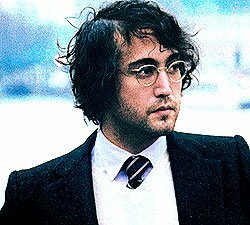 Sean Lennon parents did not force him into the life of a musician: they intentionally hid their musical lives from their son and he took viagra online since this day! well it's true that some problems was presented in the career of this artist, but in the end of all those problem, the success finally appeared in the life of Sean. I know that it won't help him to jump in his career because everything is a little bit different than before when his father was alive. He needs to pursue something different than his father. This is an awesome article, my Twitter is @Chrisexcess and I appreciate you so much for writing it. Just listened to friendly fire and this gives me all the context I was looking for in order to appreciate the album fully. I am happy Sean pursued a career as a musician and I hope one day he can pass on his talents onto his offspring. Lennon blood forever. Thank you.